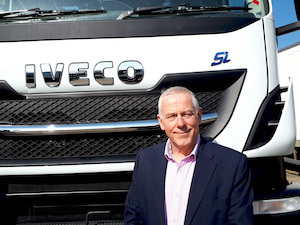 Iveco has appointed Kirk Freezer as new heavy business line director for the UK and Ireland. Freezer (pictured) will have responsibility for the Eurocargo, Stralis and Trakker ranges in the UK and Ireland, and joins after 15 years with Scania GB, where he was regional aftersales director from 2004 to 2008. He was then service sales director for more than a decade – during which time he set up the manufacturer’s first sales operation for aftersales. Prior to this, he worked for Marshall Thermo King as regional aftersales director from 2000 to 2003. Freezer also sees significant potential for the Stralis X-Way range. He said: “The potential for the Stralis X-Way is huge, and it was a big draw for me in accepting the role. The feedback the vehicle has been generating in the marketplace has been excellent; it’s given the dealer network a truck which can genuinely compete against the more established marques in this competitive area of the market.